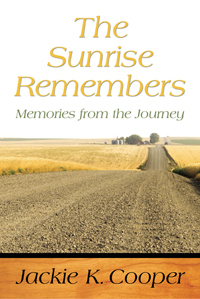 Jackie K. Cooper, the beloved author of Journey of a Gentle Southern Man, Chances and Choices, Halfway Home, and The Bookbinder is back with a new collection of stories in The Sunrise Remembers. Every morning when the sun rises it brings back the memories of your life and loans them to you for another day. At least this is what Cooper believes and uses as the inspiration for his new book of stories. As each new day dawns, the sunrise provides us with memories of our past and in that way helps to shape our present and our future. For after all memories are golden drops of dew on the lawn of our lives. They are there for us to discover and to savor. Join Cooper as he remembers a life well lived and a present that is inspiring. From movies to family to the death of a close friend, join Cooper on another homespun and genuine revelry through life’s turns. With an entertaining wit and easygoing style, he once again reminds of life’s essentials and what it means to be part of a world that still has the power to leave us speechless. As you open these pages, the sunrise is breaking through the clouds and the memories await.